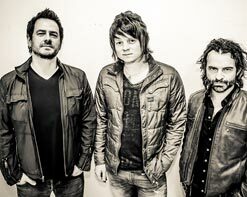 Lotus Crush "Hearts and Minds"
In 2006, Scotland-born Terry McDermott was fronting Driveblind who just dropped their self-titled major label debut. Invited to support multiplatinum alternative rock luminaries Candlebox on tour, he forged an instant bond with Candlebox’s six-stringer Peter Klett and drummer Scott Mercado, sharing a love for Pink Floyd, The Verve, and other British heavyweights. After Driveblind disbanded, Terry settled in New Orleans. On a whim in 2010, he reached out to Peter about doing a project together. Peter called bandmate Scott. The musicians, now known as Lotus Crush, recorded their first effort, 2011’s Half Light Morning. Unforgettable gigs at SXSW followed, and the group began to build a significant fan base of its own. The “right time” happened to be in 2014 and the band holed up in Robert Lang Studios with producer Todd Burman and began crafting what would become their sophomore effort, Rabbit Hole. A marked evolution occurred this time around, as everything expanded sonically. The first single, “Hearts and Minds,” which was exclusively debuted by Yahoo Music, builds from a melodic clean guitar into an unshakable refrain punctuated by Terry’s dynamic vocals. The accompanying video, starring C Thomas Howell, has been called “a surprisingly intense military mini-drama” by Entertainment Weekly. The video is an invigorating narrative about the blurred lines between good and bad while living under the overreaching authority of a big brother styled government. As is often the case in a work of revolution and dissent, the battles for hearts and minds is on full display. Are these individuals lawless rebels disrupting the peace or are they fighting an uphill battle to try to secure a better world? It’s a tremendous piece of cinema, and we encourage you to buckle up and enjoy the ride. We’re psyched to be working with Lotus Crush to bring you this spellbinding clip. Please hit us up to find out more about Lotus Crush and what we can do to get this video into your programming by contacting Andy Gesner and the HIP Video Promo team at (732)-613-1779 or e-mail us at info@HIPVideoPromo.com . You can also visit www.Facebook.com/LotusCrushMusic/ for more info on Lotus Crush.